Hello... I'm back again this week with another FREEBIE!.. 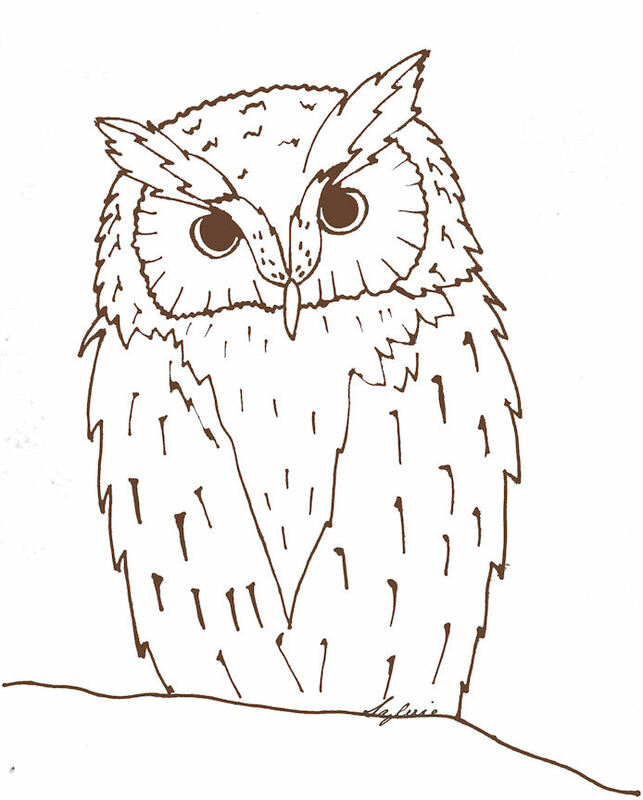 I drew the owl this morning and then decided to make it brown outline instead of black so that you can change the colour if you want to... Owls are pretty much in at the moment.. in all shapes, sizes and colours... so have lots of fun! 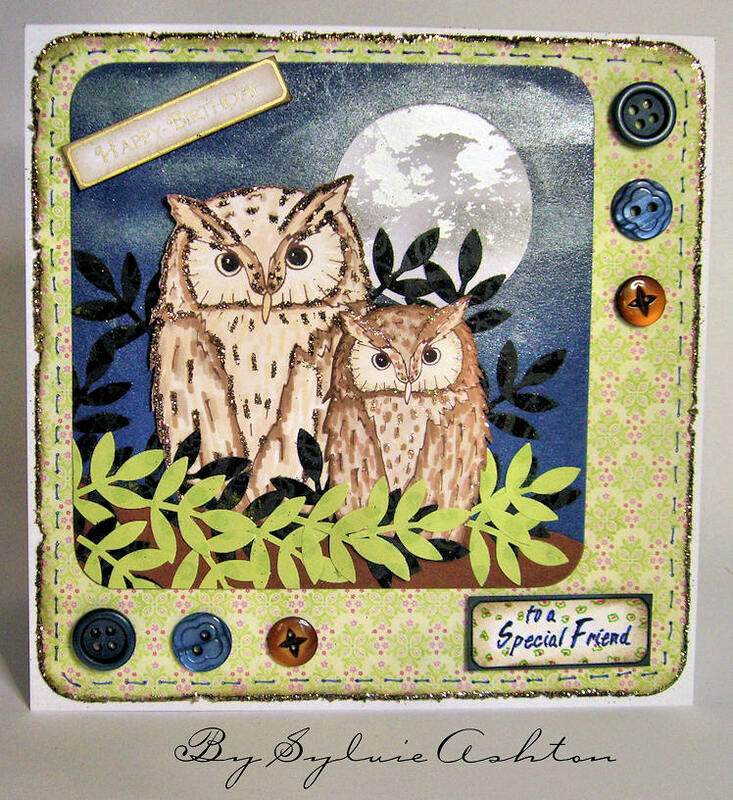 Here's my card with the owl... a night time scene.. I used some pearl foil on a circle to make the moon 'shine'.. but before I stuck it down I used some rub-on pastes - pearl lustre and silver and some midnight - to give the glow around the moon...it looks so much better in the flesh because it really does give a good moonglow effect..try it and see. I think you can guess that I used a Martha stewart leaf punch with shiney patterned black and green papers. I coloured the owls with promarker pens and added a little glitter to each bird. The backing paper is from a freebie 6" paper stack that came with the August issue of Cardmaking & Papercraft magazine...well worth it! I distressed the edges, then inked with Tim holtz walnut stain and then added a touch of brown glitter and I am really pleased with the look..... I was inspired by Cards by Kim... her cards are just beautiful. Have a great weekend everyone and don't forget to share your creations, I'd love to see what you do with him/her. Gorgeous image, love your talent! thanks for sharing it with us. This is a lovely owl, thank you. Love the way you have used it in your card! What a fabulous owl image...thank you!! This owl is very nice! Thank you! Your images are awesome! Thank you so much for sharing your creativity! Love the owl, thanks for sharing. Thank you very much for this owl image. The way he eyes are make him look like he is actually looking back at you. I love this! And I love working in brown..... gives a wonderful soft feel....thank you so much for sharing your talent with us Sylvie! Thanks Sylvie! Another great image! thank you so much for the freebie. the owl looks perfect in brown colour, it made colouring look more realistic. So lovely. Thank you very much. Thank you for sharing another great image. The images are great, thank you. 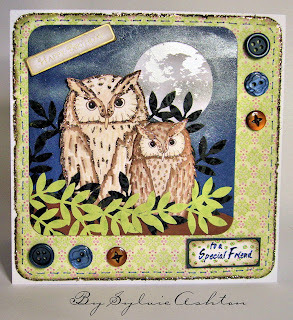 Cute owl...love your inspiration card...thanks so much for the image. Love the owl. Thank you for the freebie. You are awesome.